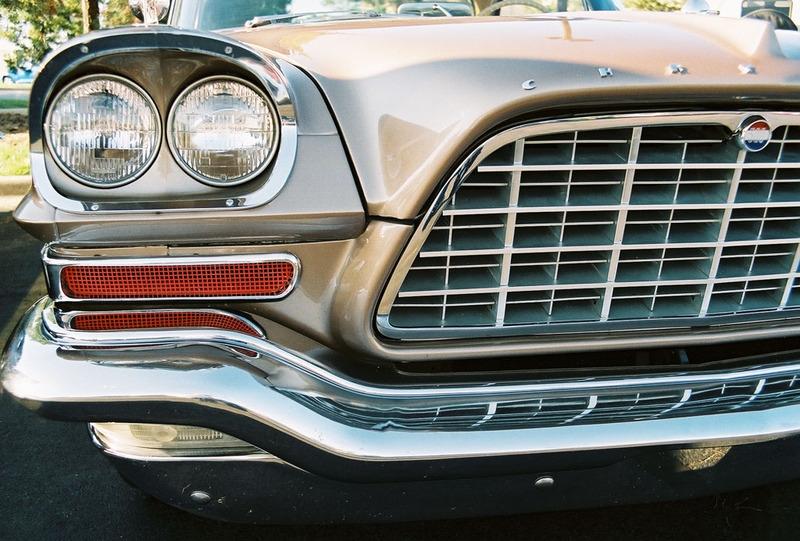 Styling of the 300C was very clean and simple by 1957 standards, and as such remains elegant today. 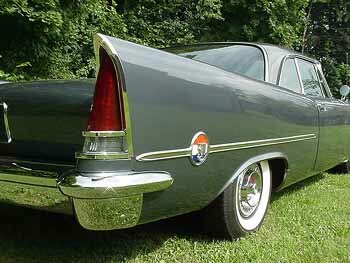 The tailfins which led the industry then were very well integrated into the design, as well as providing a steering correction reduction of 20% in crosswinds. 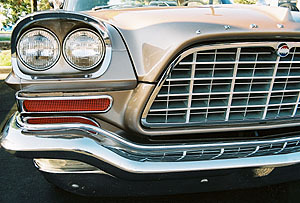 Other styling features providing a most functional aspect to the car were the unique brake cooling ducts and the brutish open grille supplying a maximum amount of air to the radiator. In fact, the front of the 300C was taken straight from Styling Car No. 613, Virgil Exner’s idea of a man’s sport car. This medallion motif is by far the best recognized of all, and survived on the letter series through 1962. Wheelcovers for the 300C were taken straight from the 1957 LeBaron, the only difference being the red paint around the center spinner. This fact is salvation to many of us latter day collectors frantically hunting these covers for our “BRUTE.” Some early cars evidently came with stock LeBaron covers. The white convertible on the cover of Motor Trend, March 1957, is so equipped, as is the car (#3N571292) of one of our members, Mr. George Riehl. On the interior, many changes were evident in comparison to the previous year’s 300B. The rich pleated leather upholstery garnered praise from all automotive writers. No other car had seats like these. New for 1957 also, were 300 numerals on the inside of the car, an embossment barely visible above the center of the back seat, silver colored appliques on each door trim panel, and the red, white, and blue medallion on the glove box door and horn button. The door trim panel 300 applique on earlier models had no rectangular border, whereas later cars did. Arm rest plastic supports were black on very early cars (ref. : 300C test, Motor Trend, March, 1957; 300C advertising brochure) but were shortly changed to matching tan. The 300C was available in five (5) solid cars, up from three (3) in 1956. Two metallic colors, Parade Green and Copper Bronze, were offered as well as straight shades of Gaugin Red, Cloud White, and Jet Black. 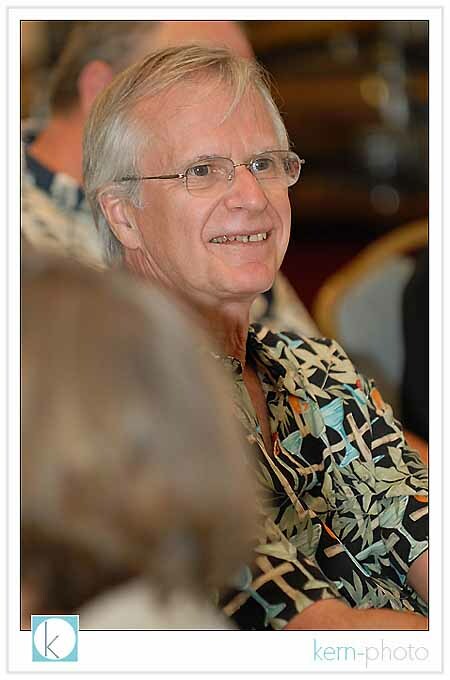 However, it would appear that special orders could occasionally be obtained if the purchaser had the money and/or influence. One of our members owns a 300C painted a dark metallic blue (coded “Z” on the body plate) and equipped with a single carburetor New Yorker engine! He has verified this with the original owner to be the way the car was ordered and delivered. As most readers are probably aware, the standard 300C engine was the 392 cu. in. Firepower unit rated at 375 HP @ 5200 RPM and 420 ft-lbs of torque at 4000 RPM. However, an optional engine of even more impressive specifications was available; 390 HP @ 5400RPM and 430 ft-lbs of torque at 4200 RPM. This engine was available at extra cost as part of the optional chassis package which included limited slip differential, low back pressure exhaust system, manual transmission, manual steering, and manual brakes. There is some confusion regarding which optional camshaft was actually used in the 390 engine. Perhaps both were at different times. 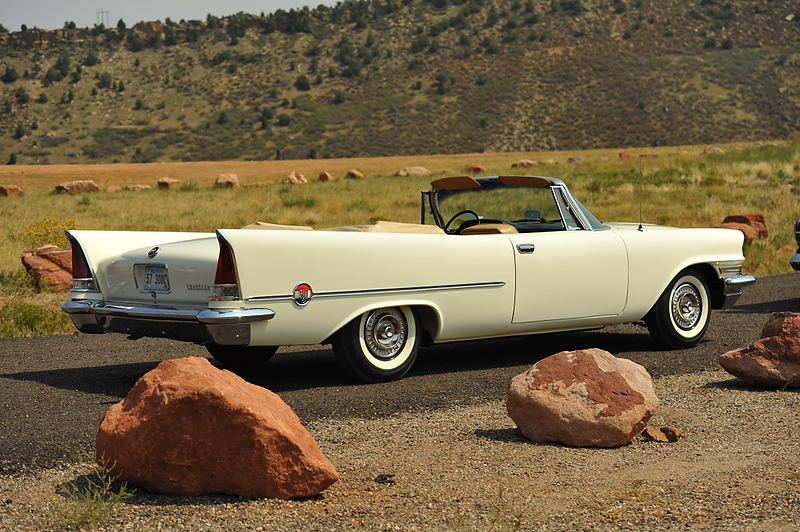 The 3000 camshaft was released for the first optional engines, while the 2550 cam is listed in the AMA specs, dated 2-4-57. As more reliable information is obtained on these camshafts, it will be published. Holley carburetors were also listed as options on the 300C engine in the 1957 AMA specification sheets. However, Mr. Gene Carr, Chrysler engineer who worked with engines at that time, indicated that space consideration made their usage impractical. Those of us who have adjusted the front carburetor idle screws or tried to set ignition points with the distributor still in the car will attest to the cramped quarters, even with the Carters! I have not been able to determine accurately how many 390 HP engines were installed in the 300Cs, but most guesses by Chrysler personnel vary from 20 to 50. The special low back pressure exhaust system consisted of 2 ½” diameter exhaust pipes, exhaust extensions, mufflers, and tailpipes. The exhaust manifolds were from Dodge trucks and had 4 bolt flanges, as did the special exhaust pipes. These exhaust systems were used at Daytona and allowed the already potent 300 engine to really breathe and achieve speeds in the range of 140 MPH. The limited slip differential, manual brakes and manual transmission had no special distinguishing characteristics other than the clutch was eleven inches in diameter rather than the ten inch unit used on Windsors. Total plate pressure was about 15% higher. As was mentioned earlier, all information available stipulates the 390 HP engine was only obtained with the optional chassis package. However, I have personally seen and ridden in one of the 300Cs which ran at Daytona (#3N571164) and this car had an automatic transmission. It would seem that, as with other aspects of 300s, what was officially released did not always appear in that combination on the vehicle. Some race drivers preferred their cars equipped with power steering to achieve the quicker ratio. They then disconnected the pump to save power! Driving one of those took muscles. 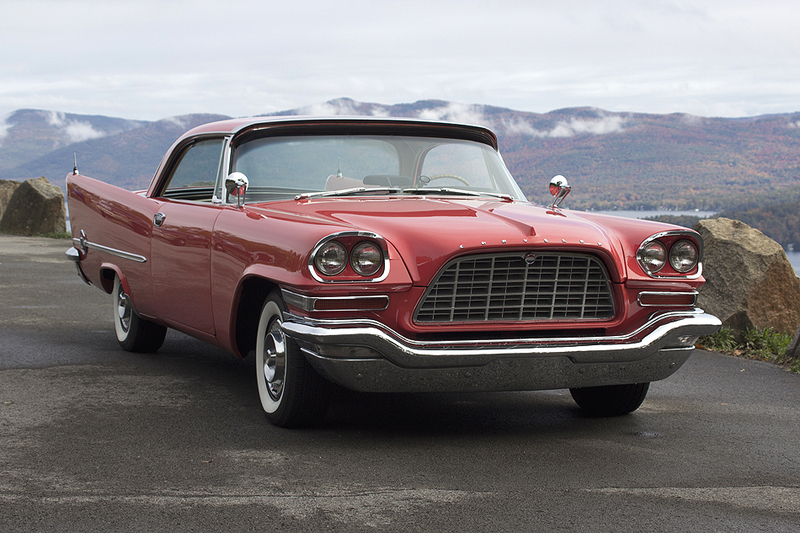 The Chrysler Proving Ground ran top speed tests on the 300C in November of 1956. Speeds in the 145 mph range were obtained; however, drag reducing shields were used over the headlights and above the windshield. Removal of these shields resulted in a speed reduction of about 6 mph. These runs were also made without air cleaners, mufflers, or tailpipes and with 60 PSI tire pressures. 3.18/1 or 2.92/1 gears produced virtually the same speeds. So it would not be reasonable to assume that one could duplicate these speeds in his restored, streetable 300C. The 300 was again the fastest sedan at Daytona, but its top speed of 134.1 mph was not equal to that attained by the 300B in 1956. The price of the rugged, masculine, but wind resistant front end styling was being paid. Though the 300C was groomed as the successor to the 300B on the stock car circuit, it will never be known actually how well it would have done. In June of 1957, the AMA banned open factory participation in racing. Except for the annual Daytona speed trials, real high speed competition was a thing of the past for the 300.